In an attempt to create a good Baked Onion Rings recipe, I’ve had to experiment quite a bit. It hasn’t been easy because let’s face it, fried onion rings taste fabulous and are incomparable when done right. And there is much discussion about whether frying in olive or even avocado oil makes deep-fried foods healthy. 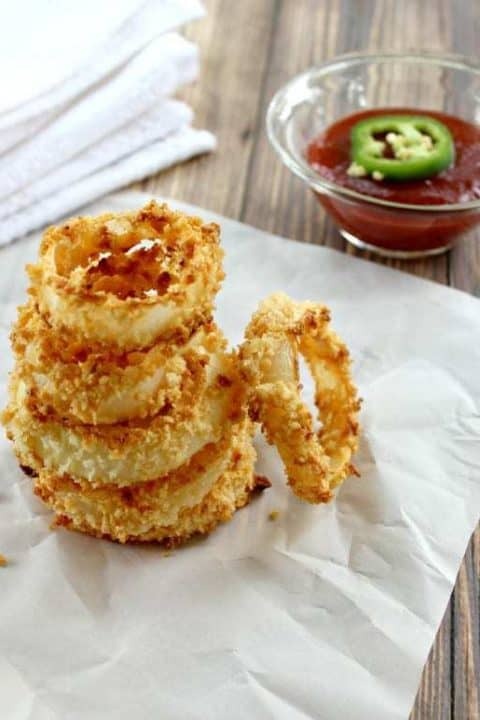 Either way, it’s good to have variety and this IS an excellent baked onion ring recipe. When looking for my baked onion ring option a few things mattered. 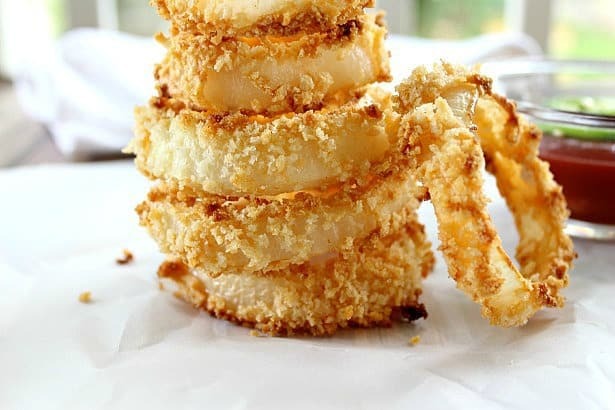 First of all, the onion rings would need to be crispy, so adding panko bread crumbs to the flour mixture became a good option. Then adding a bit of olive oil to the bread crumbs gave a hint of deep-fried flavor that traditional fried oven rings are known for. Last and of course!, they had to have excellent flavor, otherwise what’s the point? I added smoked paprika, just a hint of cayenne and some Parmesan along with salt. This seasoning combination worked well together without being too spicy or overpowering. Soaking the onions in buttermilk infuses a mild, almost creaminess to the rings. Dipping first in flour helps the batter stick to the onions and the panko mixture adds just the right amount of crunch. Set-up the process in assembly line fashion and it goes pretty quickly. You can serve these with your favorite dip or ketchup, but they’re seasoned perfectly if you want to eat them straight up! This is a baked onion recipe where the rings come out crisp and flavorful and you won’t even miss the deep-fried version (much). 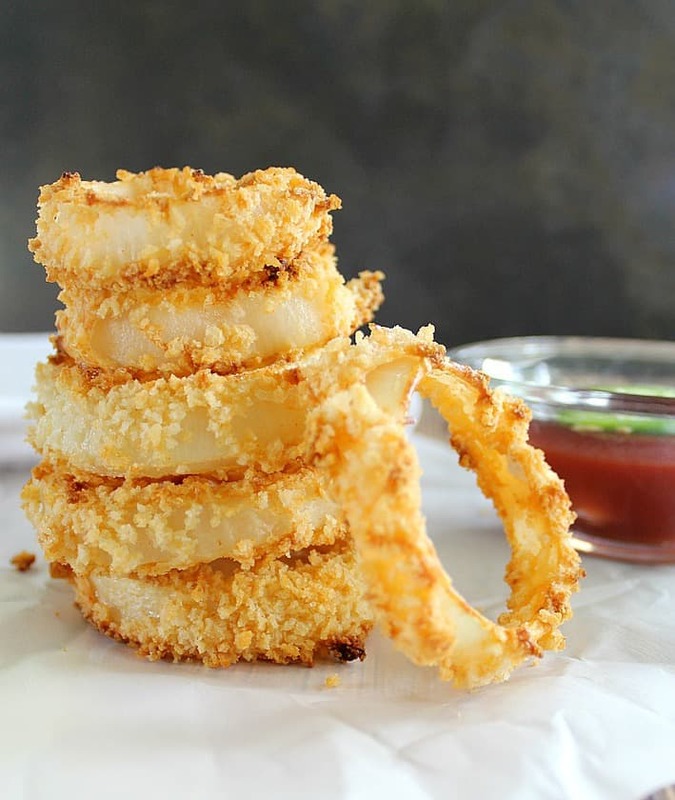 These baked onion rings are a healthy alternative to fried rings and offer the right amount of crunch. Set up your pans and dipping bowls in assembly line fashion for quick work. In a large Ziploc bag, add the onions and 2 cups of the buttermilk. Refrigerate for at least 30 minutes, but an hour is ideal. Flip bag occasionally. In a small bowl, combine the flour, paprika, cayenne, and 2 teaspoons salt. In another bowl or shallow dish, whisk together the remaining 2 cups of buttermilk and eggs. Add half of the flour mixture to the buttermilk and beat until smooth and thickened. In a separate bowl, combine the panko, Parmesan, olive oil and remaining 2 teaspoons salt. 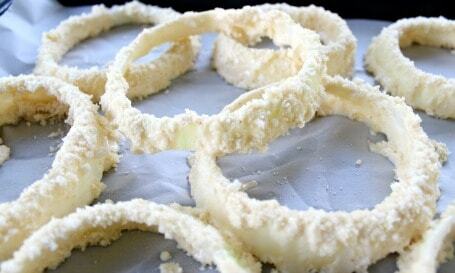 Lightly dredge the onion rings in the flour mixture and then drop into the buttermilk. Drain the excess batter and then lightly dredge in the panko mixture. 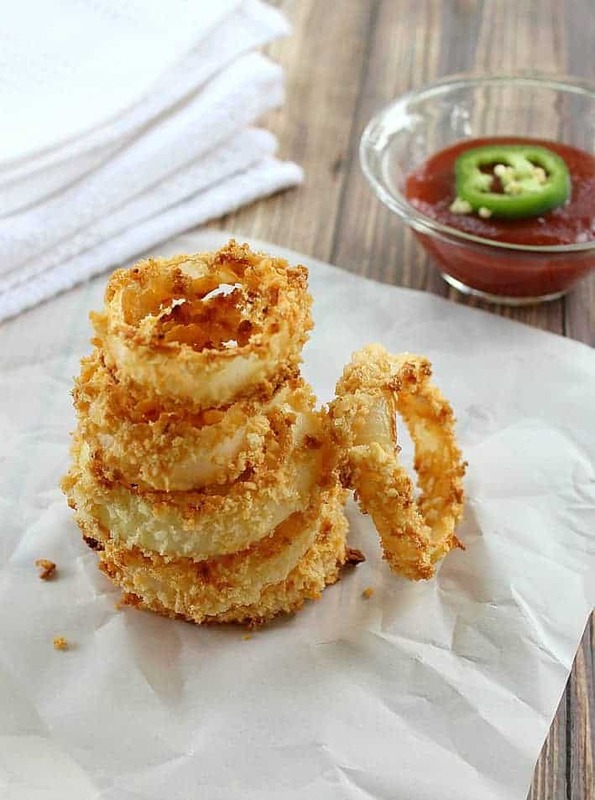 Too much of the panko on the onions may result in your rings being too hard, so don't force more than will cling to the batter.